EVERYDAY CARRY (EDC) or Every Day Carry refers to items that are carried on a consistent basis to assist in dealing with normal everyday needs of modern western society, including possible emergency situations. Some of the most common EDC items are knives, flashlights, multitools, wallets, smartphones, notebooks, and pens. The type and quantity of such items may vary widely. While often distributed among pockets in everyday clothing, carry options are frequently expanded by the addition of clothing accessories like a fanny pack, purse, small day pack, bracelets, or even footwear like long boots or a vest with pockets. The multiple large pockets of cargo pants make them a popular choice among people who carry EDC items. Occupational: Those who work in a warehouse or outdoors may carry a pocket knife or box cutter and work gloves. For those who are in the medical field, having emergency latex or nitrile gloves can be important. Disaster-related: For those who live in a disaster prone area, having a flashlight and a communication tool may be essential. Team support: Those whose partner(s) or team members carry a weapon of some kind, may carry a first aid kit or extra ammunition as support in case of incident or accident. Health-related: Those who (might) require medical attention or are prone to sudden ailments (or are often with someone else who does) may carry prescribed medicine. Time-related: Having a time piece is sometimes necessary for timing critical everyday actions or to be on schedule. Safety: A weapon such as a firearm, knife, tactical flashlight, tactical pen, pepper spray, stun gun, or a small impact weapon. Wilderness: A compass, fire starting and water purification items might be suitable, and an air horn may be useful to scare off aggressive wild life. 11 Everyday Carry Shops Every Guy Should Know - Cool Material. 1000+ images about Every Day Carry - Pinterest. AMERICAN CITY SURVIVAL GUIDE - Wired. EDC Forums - "Have you seen some of the newest items made by EDCF members and available in the Craftsman's Corner? Check out the forum's talent!" Every Day Carry Blog - "Everyday carry (EDC) refers to various items, usually small, that are worn or carried by a person on a daily basis for use in everyday tasks from the mundane to the unexpected." Everyday Carry. What essentials do you carry on a daily basis? - Reddit. Everydaycarry.com - since 2009. "Online magazine showcasing pocket drops, or systems of items carried everyday, submitted by its readers and contributors within the EDC community." Huckberry - Everyday Carry Online Shop. Mission Workshop -Everyday Carry Accessories. Survive Anything by Always Carrying These 13 Pieces of Gear - Wired. Swiss Army knife - pocketknife or multi-tool manufactured by Victorinox AG (and up to 2005 also by Wenger SA). The term "Swiss Army knife" was coined by American soldiers after World War II due to the difficulty they had in pronouncing "Offiziersmesser", the German name. The Everyday Carry Guide - "Everyday Carry – EDC Essentials for the Discerning Gentleman." What are your EDC essentials? 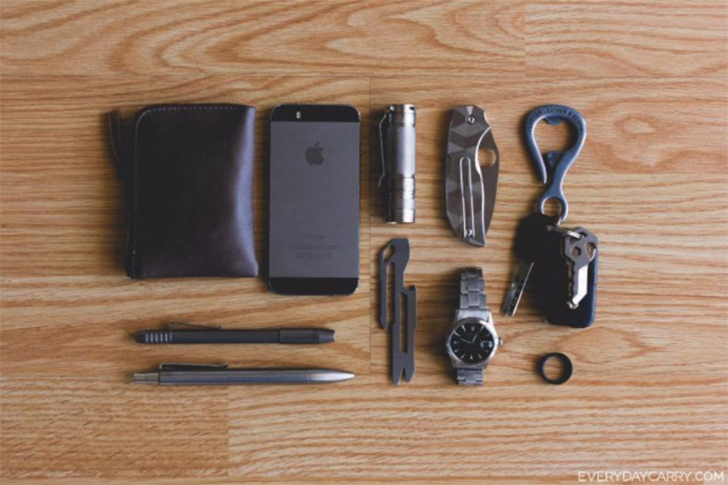 - "A peek into the pockets of people worldwide, showcasing our every day essentials." What Is EDC? - "The Beginner's Guide to Everyday Carry." What is Everyday Carry (EDC)? - "The Art of Everyday Carry: A Beginner’s Guide to EDC." The Art of Manliness. What You’ll Need to Escape New York - The New York Times.